This example demonstrates how you can create, delete camera users and how you can modify the passwords of your users in C#. To implement this example, you need to have OZEKI Camera SDK installed, and a reference to OzekiSDK.dll should be added to your Visual Studio project. 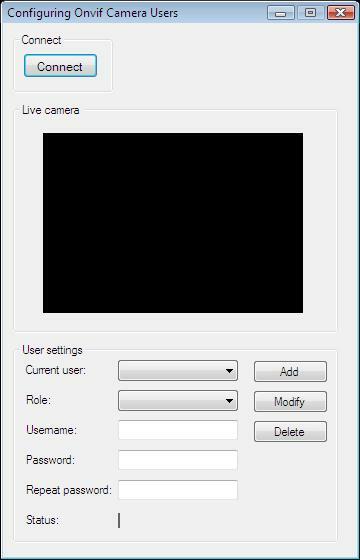 How to create camera users and modify their passwords, how to delete a camera user using C#? In addition, the application has three more functions, the click events of the buttons Add, Modify and Delete. When you press the Delete button, the program deletes the selected user with the RemoveCameraUser() method than it's going to fill the comboboxes again with the new data. After the successful implementation of the functions and the GUI elements, the application will work properly. Pressing the connect button will load in the image of the IP camera device connected to your PC into the panel that you can see on the picture.